Like most of us, I love tradition – especially at Thanksgsiving – but I can’t resist a recipe alteration here and there. Our table, probably like yours, will be filled with mirlitons, sweet potatoes and of course, the turkey, but I often resist the tradition of making them the same way every year. This year, I will add Italian sausage to my mirlitons, resurrect an old-fashioned version of sweet potatoes and put a new twist on my spinach casserole, making it easier with a little reduction in fat. My family may never notice these subtle changes, but what I’m hoping for is that look of satisfaction when the taste buds are happy and second helpings empty the bowls. Italian sausage has long been my friend in cooking. When I added it to my stuffed bell peppers, people began to rave. That gave me the idea to keep the shrimp in my mirliton stuffing but add Italian sausage for extra flavor. Whether yours is a casserole or the peppers are stuffed, this make-ahead dish freezes well, saving time on the big day. My husband’s mother made this old-fashioned version of sweet potatoes, but he had to adjust to my technique of whipping the potatoes and putting all sorts of crunchy stuff on top. I’ll just add some of the crunchies to the sauce to give him a memorable treat this year; it’s also easier to prepare. 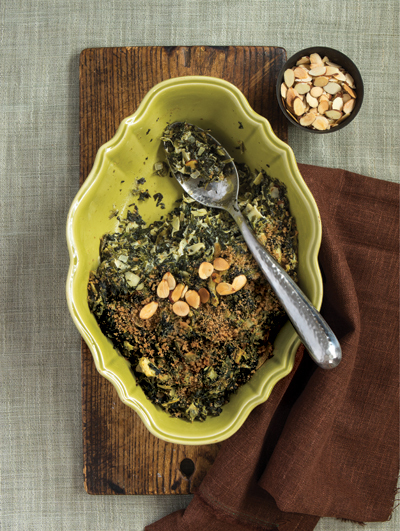 For years, I made the same spinach casserole because everyone requested it. It was filled with butter and cream cheese. My new take on it is equally good, but goat cheese cuts the calories and adds simplicity to the recipe. My son-in-law fries the turkeys and my husband makes the rolls. My daughter and I handle the sides and desserts. Now all I have to do is come up with a new version of pecan pie. I may have to draw the line there and keep that delicious tradition as it is. Melt 2 Tablespoons butter in a large skillet and sauté onion until translucent. Add almonds and sauté until slightly browned. Add artichokes and sauté for several minutes. Mix in spinach and then goat cheese. Season with salt and pepper, and place in an oven-proof casserole or baking dish. Sprinkle with bread crumbs and dot with remaining 2 Tablespoons butter, cut into ½-inch cubes. An hour before serving, place casserole in a preheated 350-degree oven and bake until bubbly and slightly brown on top. If casserole has baked 30 minutes and has still not browned, place under the broiler to brown. Place mirlitons in a pot and cover with water. Boil until mirlitons are fork-tender. Drain and cool mirlitons. Peel and devein shrimp. Cut each mirliton in half lengthwise. Scoop out flesh leaving 1/8-inch shells and place flesh in a medium bowl. Line the shells on an oiled baking sheet. In a large skillet, sauté the onion in oil until transparent. Add garlic and sauté 1 minute more. Add Italian sausage and cook, stirring, until browned. Add mirliton flesh, mashing with a fork, and seasonings. Mix well, cover and simmer over low heat for 15 minutes. Add shrimp and cook, stirring, until shrimp are pink. Mix in parsley and stuff mixture into mirliton shells, dividing equally. Sprinkle with bread crumbs and sprinkle with butter. Bake in a pre-heated 350-degree oven just before serving for 30 minutes or until slightly browned on top. If making a mirliton casserole, discard the shells and place mixture in a 9-by-13-inch baking dish, add the toppings and use the same baking instructions. Place sweet potatoes in a large pot and cover with water. Boil until fork tender. Drain and cool. Peel potatoes and slice each potato lengthwise into 4 thick slices, about ½ inch thick. Layer half the slices in the bottom of a 9-by-13-inch baking dish, and sprinkle with 2 Tablespoons each of the syrup, then butter. Sprinkle lightly with seasonings, and then 2 Tablespoons brandy. Repeat with another layer, and sprinkle pecans on top. About an hour before serving, bake the dish in a 350-degree oven for about 20 to 30 minutes, basting once or twice, until sweet potatoes are bubbly and slightly browned.